A clear, flat surface is the basis for most workstations. The bigger question is this: how will it be used? Will you be packing orders? Repairing or assembling? Will it integrate with conveyors or assembly lines? Will you need access to certain supplies? Ergonomic considerations will play heavily into this part of the decision making process. Sure, a larger benchtop might be optimal, but it’s possible that your area won’t support the footprint for it – front to back, side to side, floor-to-work surface. You have to have a work surface that’s large enough for the intended operation. Packing a 18” x 18” box takes less space than tearing down a small engine, or assembling a complex component. Watch the process and understand the needed “elbow room” for your operators. Even the feeling of a cramped area might be enough to hamper productivity. Bench tops are available in a large variety of standard sizes, and a near-infinite amount of custom sizes. Get enough space, but understand how much “enough” is. How does the workbench relate to the operation? The way product reaches the workbench can be critical in its dimensioning and design. Should workbenches in a progressive assembly operation be the same at each station? What layout configuration should be utilized, and how might that affect the type of workstation and where it’s located? Can it integrate with conveyors? What storage do you need? You could spend (literally) a month researching this topic. There are simple storage components that plug into a broad variety of benches, and each might be useful in different ways. 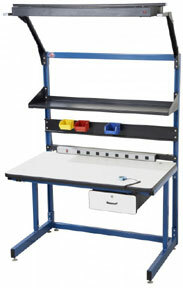 Some operations need no storage at all, just an economical workbench top for inspections or basic sort operations. Some require a large amount of highly specific storage, such as packaging operations where the availability of supplies at hand plays a major role in productivity. If space is tight, overhead storage can become critically important. There are endless variations, from hardwoods to ESD to laminated to steel tops. Each will provide a slightly different experience, longevity, and functionality. Stainless steel tops are ideal for food handling or for any operation where corrosion is an issue. Steel tops are extremely durable and relatively inexpensive, but should not be utilized in moisture applications. Hardwood tops are very durable, very flexible but tend to be more expensive. Laminate tops are less expensive and extremely useful, but sometimes cannot handle heavy applications the way steel or wood can. See Workbench Tops: Which is Best for Your Application? Often an afterthought, the way a workstation is lit can be crucially important to the usefulness and functionality of a given workbench. In industrial applications, a typical facility’s lighting may be inadequate for assembly or inspection work. Most workstations offer lighting options that allow isolated, clear illumination directly onto the workbench surface. For quality control, packing, or inspection, lighting should be a top priority. Again, this is usually a case of what’s available in the footprint your workbenches will occupy. For lighting, for tools, and for machinery, having power at the bench is highly useful. Most workbenches have options for power strips, direct wiring, and air supply. It’s a top consideration for benches where a balancer or other tools are needed. Musculoskeletal disorders can develop when workers lean, stoop, twist, or reach. These postures also reduce productivity. Recommended working height for standing workers is 42”. For seated workers, 30.5” is the best for about 99% of people. Adjustable height benches or stepping stools are often utilized in multi-shift operations to ensure that the optimum comfortable height can be accommodated no matter who’s using the bench. Reach distances (to the middle of the worksurface or onto a conveyor belt, stacker, or other loading device) should be made no more than 18”, depending on the item. The ability to accessorize a bench, either when you buy it or later can pay dividends. Ask your provider whether the accessories can be added after the fact. Risers, drawers, tool balancers, lighting, computer arms, bins, ESD kits, shelves, and specialized storage such as paper rolls & carton shelves are all available to allow you to turn a simple flat workbench into a defined-use workstation as needs arise.